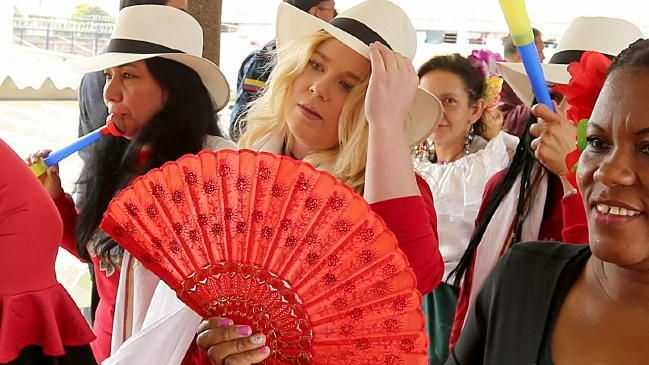 CASSIE Sainsbury has spent a day dancing and cheering at a raucous beauty contest inside the Colombian jail which may be her home for decades. El Buen Pastor opened its doors for a two-day pageant and cultural festival, with the entire prison population of more than 2000 involved, either as entrants, carrying handmade floats or as part of a roaring crowd with deafening vuvuzela horns, the Courier Mail reports. A winner will be decided today. Wearing a traditional Panama hat and scarf, Sainsbury, 22, clapped as at one point her murderer mate Diana Alejandra Ávila wheeled about on stage to pulsing South American music and drums.